This is our Examples Blog that provides you with in depth writings and examples regarding our Austin TX Solar Screen services and installations. 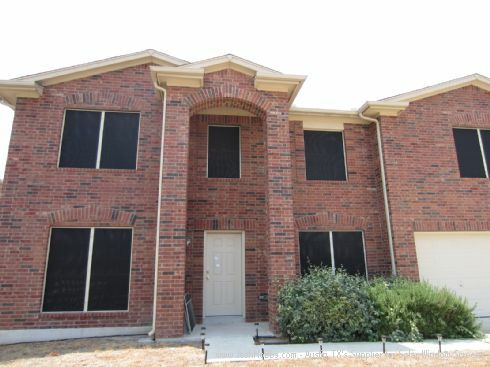 We install a ton of solar screens in the Austin, Texas area. This Austin Texas solar window screen installation involved black with tan frames. 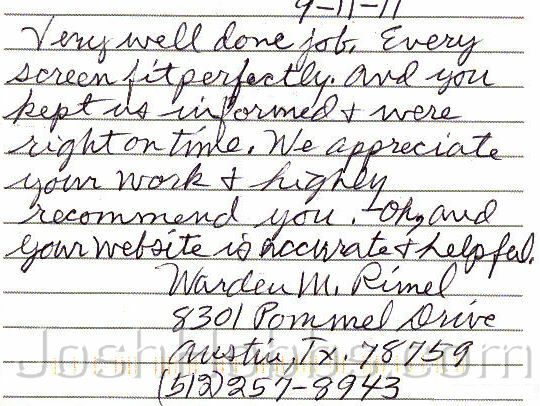 The customer was very pleased with the job that we did, and wrote us this very kind hand‑written review. The customer was ecstatic about how well the screens fit. We are very careful when we build our screens, to build them perfect, so that they fit flawlessly. That’s something that is a talent, that’s something that takes skill, and that’s something that we do very well. They were pleased that we showed up on time. We measured the home when we told the customer we would. We installed the screens on time when we said we would. They appreciated our work. They told us time and time again they were going to recommend us. On our review page we have many more solar screen customer reviews. They were very pleased with the ease of our website, how easy it was to create their own solar screen estimate, and how accurate the whole process was. As well as, they liked our thorough “Questions and Answers” page and helpful videos on our website. Very well done job. Every solar screen fit perfectly, and you kept us informed and were right on time. We appreciate your work and highly recommend you. Oh, and your website is accurate and helpful. This entry was posted in Reviews from our Solar Screen customers on November 25, 2014 by admin. Solar Screens to shade a door. Sun Shades for windows around the front door.